The Nu-chu-nulth (formerly known as the Nootka and West Coast) were among the earliest First Nations to have contact with European explorers. Yet today, very few Nu-chu-nulth artists are well-known. I can think of Patrick Amos, Joe David, and Tim Paul, and have to do a web search to come up with any other names. This lack is unfortunate, because, while the Nu-chu-nulth sometimes work in the northern formline tradition, their art also includes at least one other – possibly two — schools of design that are unparallelled anywhere on the Northwest Coast. For that reason alone, a few months ago when Kelly Robinson recently offered his “West Coast Wild Man” mask for sale, I was happy to add it to the works on the walls of my townhouse. But I was also glad to buy because the mask was not like anything I had ever seen before. A 2012 graduate of the Freda Diesing School, Robinson has been selling his jewelry to galleries for several years. More recently, at the Northern Exposure show at the Spirit Wrestler Gallery, three of his four pieces sold within the first three hours of the show. He is also a skilled painter, and one of his canvases, “Mother of Mischief,” already hangs on my wall. However, most of Robinson’s work is in the Nuxalk style. He has only occasionally explored the other side of his heritage and worked in the Nu-chu-nulth style, but if “West Coast Wild Man” is any indication, he could have a significant contribution to make to that tradition as well. There are few references for Nu-chu-nulth stories, no matter what name you search under. I assume that the Nu-chu-nulth wild man has some similarities to the Bukwus of the neighboring Kwakwaka’wakw or possibly the Gagiid of the Haida. All three are often depicted with large hook noses and grimaces, and probably their symbolic taming was a feature of the midwinter dances in all three cultures. Probably, though, the parallel is not exact. The Bukwus is a dwarf, often conceived as being dead, who tries to tempt the living into eating its ghost food so that he can carry them away. Often, like the Gagiid, he is said to originate as a shipwrecked voyager. The Nu-chu-nulth wild man seems to share these characteristics, since the culture often raised memorials of skulls to shipwrecked sailors, but almost certainly some of the other context is missing. 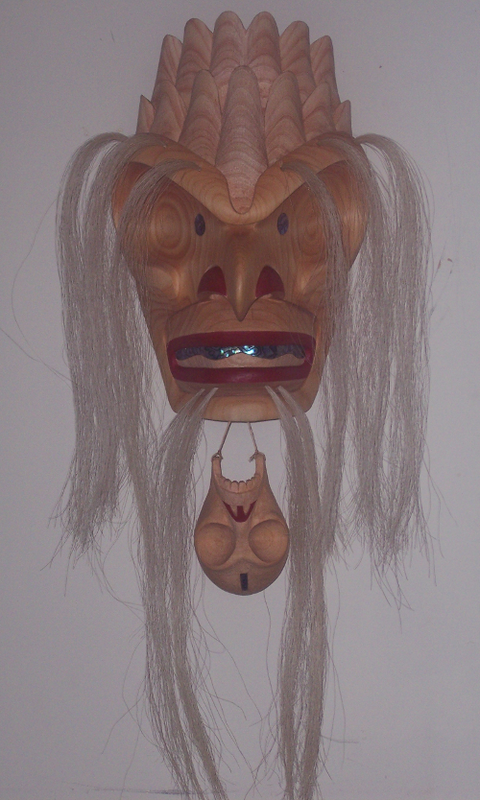 To even a casual observer, Robinson’s mask shows obvious signs of the Nu-chu-nulth style, with the inverted skull dangling below the chin, the straggling hair, and the unusually large eye sockets and relatively small eyes. Whether the hair, which resembles dreadlocks, is also traditional or Robinson’s own innovation, I am uncertain, but either way, the general influence is obvious when you compare the mask to the work of carvers like David or Paul. However, if you continue the comparison, you will notice something else. If you search on the Internet, you will soon notice that David’s or Paul’s work has an air of historical re-creation. Both artists reach a high level of quality, but their work is little different from that done a century and a half ago in the same tradition. There is nothing even mildly wrong with this choice, and I look forward someday to having works by both David or Paul around the house to enjoy. But, having trained with some of the leading woodworkers on the coast today at the Freda Diesing School – artists like Dempsey Bob, Stan Bevan, and Ken McNeil – Robinson is trying to do something more. Consciously or unconsciously, Robinson is following his teachers, and thinking of his work as fine art. His use of both paint and abalone is restrained, and his wood is finished to modern standards. He also takes full advantage of the grain, shaping it to fit his carving. While obviously based on past Nu-chu-nulth tradition, the result is something that – so far as I am aware – no other Nu-chu-nulth artist has attempted. And what is even more important, Robinson succeeds, producing a work that is both contemporary and not quite like that of any other artist. This originality – admirable in anyone, but especially so in such a comparatively young artist – is sensed almost immediately by anyone who views the mask. Robinson delivered the mask to me at the opening of the Northern Exposure show, and the first response of each of the half dozen people I showed the mask to responded was a sigh of wonder. “West Coast Wild Man” is an original work of unexpected power, and if Robinson can continue to meet the same high standards in other works, his future as a major artist on the coast seems assured. 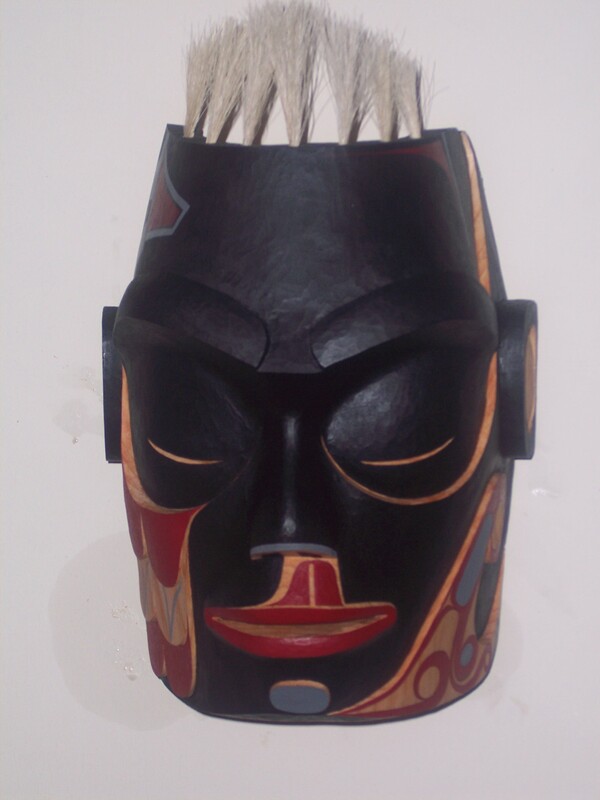 Patrick Amos is one of the leading Nuu Chah Nulth artists. From the first time I saw his work, I knew it was only a matter of time before I bought something by him. However, until I was browsing the Quintana Galleries web site about six weeks ago, I hadn’t found the right piece. There, I saw his acrylic on paper “Supernatural Wolf Transforming into Killer Whale,” which appealed in so many different ways that I immediately contacted the gallery before anyone else could snap it up. I assume (but haven’t been able to verify yet) that the piece refers to a myth apparently shared by both the Nuu Chah Nulth and Haida nations of a great wolf that was such a savage and wasteful hunter that shamans transformed it into a killer whale so that it would not de-populate the animals of the land. This is a story that I have never seen depicted in art before, which gives the piece an immediate interest for me – I mean, Raven stealing the light is a powerful story, but it’s as common in Northwest Coast art as Madonnas and crucifixions are in European Renaissance art. I simply like to see my imagination stirred by a story less often told. However, “Supernatural Wolf” is also an office in the important Wolf Society, although why one should be transforming into an orca isn’t clear to me. At any rate, transformation is a subject that often brings out the best in many Northwest Coast Artists, and this piece is no exception. Amos’ acrylic shows the wolf twisted in the throes of transformation – throes that seem all the more agonizing as it struggles in the confines of the circle. At the moment depicted, the most obvious sign of the transformation is the dorsal fin on the wolf’s back that it is evidently twisting to see (and maybe bite). However, at a second look, the wolf’s head is also sprouting the fin that is one of the killer whale’s distinguishing features in Northwest Coast Art. Moreover, if you look closely, one front leg may be changing into a flipper, while the other, with toes that seem elongated compared to the hind foot beside it, seems to have just started to change. The tail, too, is presented in a three-quarters view that makes it look flat, and more an orca’s flukes than a wolf’s brush. An additional indication of change may be the irregular and asymmetrical shapes that make up the wolf’s legs. They give a strong contrast to the wolf’s body, which exists only in outline, except for the two stars that perhaps suggest the wolf’s spirit, remaining unchanged despite the physical transformations that arre happening. For me, the piece is all the more effective because it is in stark white and black. Not everybody appreciates black and white or grayscale these days, which may be why the piece languished in the gallery for a while. Personally, though, I have always felt that, with the right subject, a lack of primary colors makes for boldness and drama, which is certainly the case here. One additional note: The small mark in the lower right is a finger print, presumably Pat Amos’. The gallery was apologetic about this flaw, but I was more philosophical. Your eye is hardly drawn to it, after all. Besides, if I ever wanted to establish provenance, I shouldn’t have any trouble (to which the employee I was dealing with replied that you could have no doubt that Amos had a hand in the work).